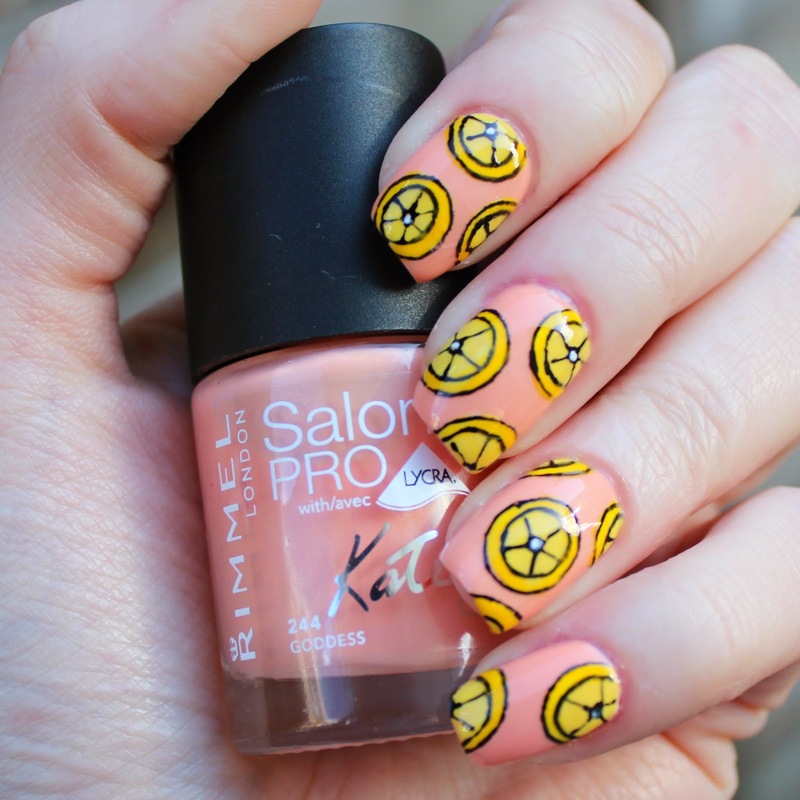 Rimmel released some new shades for summer in their Salon Pro collection. I will do a review of all of them a little bit later in the month as they are, in my opinion, better for late summer/early autumn but I thought I would show you one of my faves from the range: Goddess*. I adore this colour. It's a beautiful peach with a very subtle shimmer. For the swatch above I used three coats although you could probably get away with just two. I don't know what it is with me and fruit manis at the moment but I can't seem to get enough. I'm not 100% convinced that these lemons are the best compliment to the lovely peachy Goddess but I went with it anyway! I used my white Barry M nail pen to draw on the lemons and then filled with two shades of yellow: Barry M's Lemon Ice Cream and the aptly named Yellow. I finished off with my black nail pen and a Seche top coat. I wasn't completely happy with the result so I added some white spots for good luck. I think I prefer this version but I still wish I had drawn the lemons a bit better. No doubt I will use this polish again as a base colour so I will be able to redeem myself! That polish indeed looks gorgeous! Such a nice colour :) I love the nail art with the spots a lot! 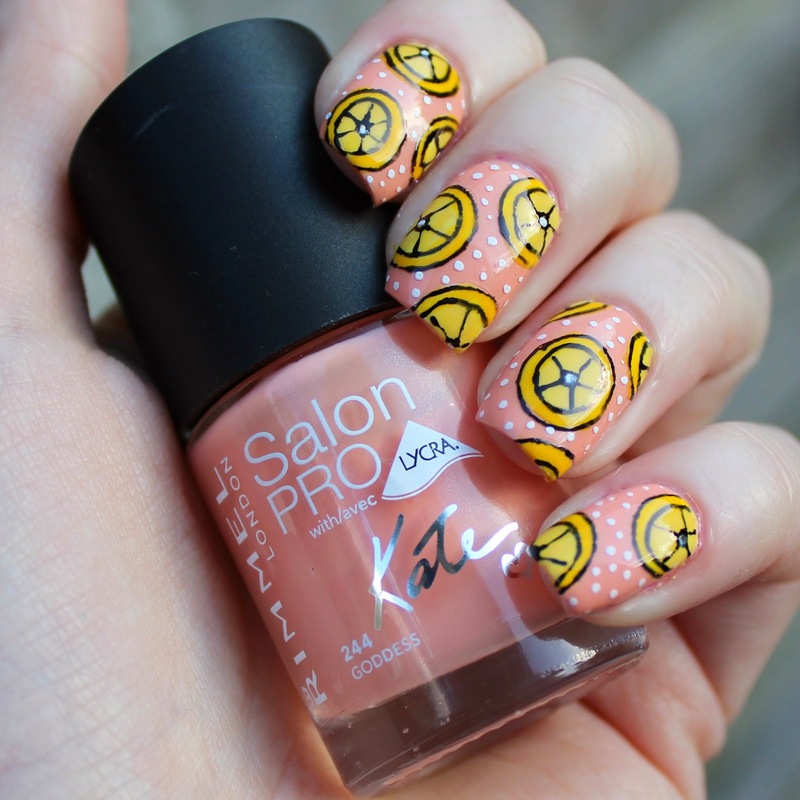 Fruit is just awesome to put on your nails so I understand the obsession!